Oversized Public Sectors. The government’s share in the economy, measured by government spending as a share of GDP. Some countries, such as France and Denmark, government spending accounts for nearly 60 percent of the economy. Even in the U.S., government spending’s share of GDP is 40 percent. 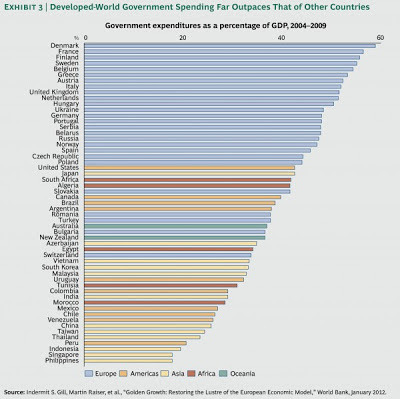 By contrast, the share of government spending in developing countries range between 20 and 40 percent of the GDP.